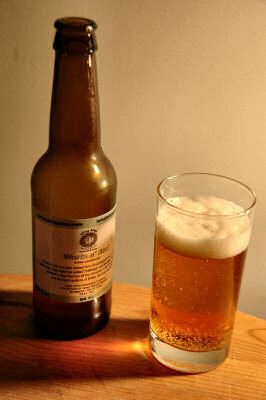 IslayBlog.com -> 2007 -> Islay Ales: Worts n' Ale! Islay Ales: Worts n' Ale! Worts n' Ale! is a beer brewed from Bruichladdich wort made from Optic malt. Islay Ales has added Challenger and Bramling Cross hops to produce a beer that has all the character of the Whisky Malt and the best traditions of British Ale all in one bottle. And what a beer this is! First of all it's strong: 9.0% ABV. It's slightly dangerous, as at least to me it didn't taste that strong, yet I could certainly feel it. But then it comes in a smaller bottle, 330ml compared to the usual 500ml (also the reason why I used a half pint glass instead of the ‘official’ Islay Ales pint glass). The taste? As written before, I'm quite bad in describing tastes. I'd say it's fairly sweet, but in a nice way. At the same time there is a peaty and smoky taste reminding me of the Bruichladdich single malt. I'd also describe it as a ‘warm‘ taste, warming you up after coming back from a winter walk.